Gallery view [left to right]: Carolyn Frischling, Appstraction; Mia Tarducci, Floor; Leah Patgorski, Yellow Somewhere; Laurie Barne, Domestics of Ritual: Vignette 3; Andrew W. Allison, Pool; Atticus Adams, Portal-Mossy. Photography by David Bernabo. If the Associated Artists of Pittsburgh didn’t exist, as the saying goes, it would have to be invented. 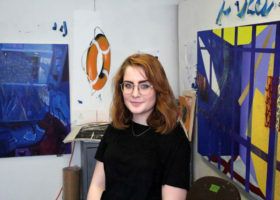 For over a century, the AAP has organized annual exhibitions, providing an important venue for Pittsburgh-area artists to exhibit and sell their work. 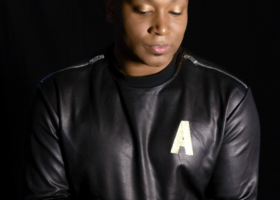 This year the 105th Annual returns to its traditional home at the Carnegie Museum of Art. 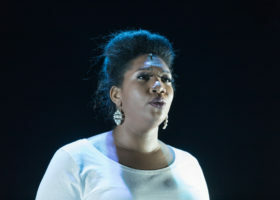 It’s a crisply installed show, beautiful and rich, but also deeply conservative, which is striking in the context of a city experiencing rapid and sometimes uncomfortable social change. This is not to say that there aren’t some wonderful moments in this show—and some outstanding individual works. 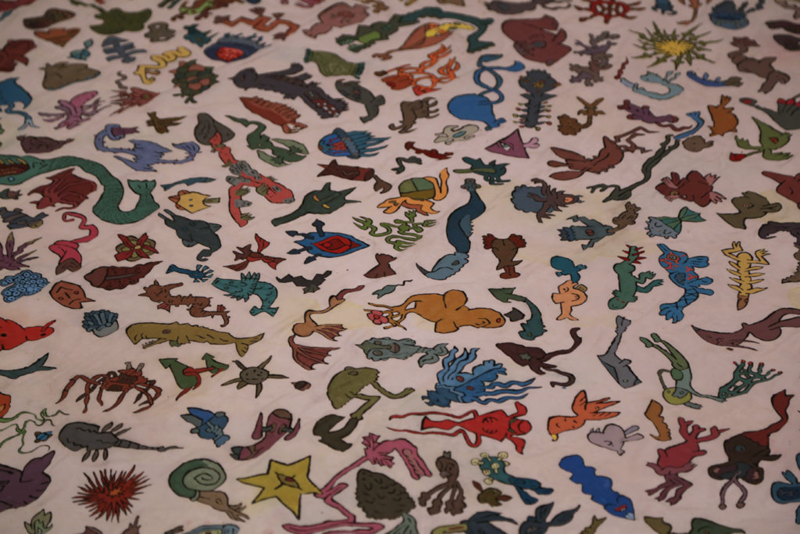 Laurie Trok, God is in the Forest Counting Trees (detail), acrylic on cut panel. 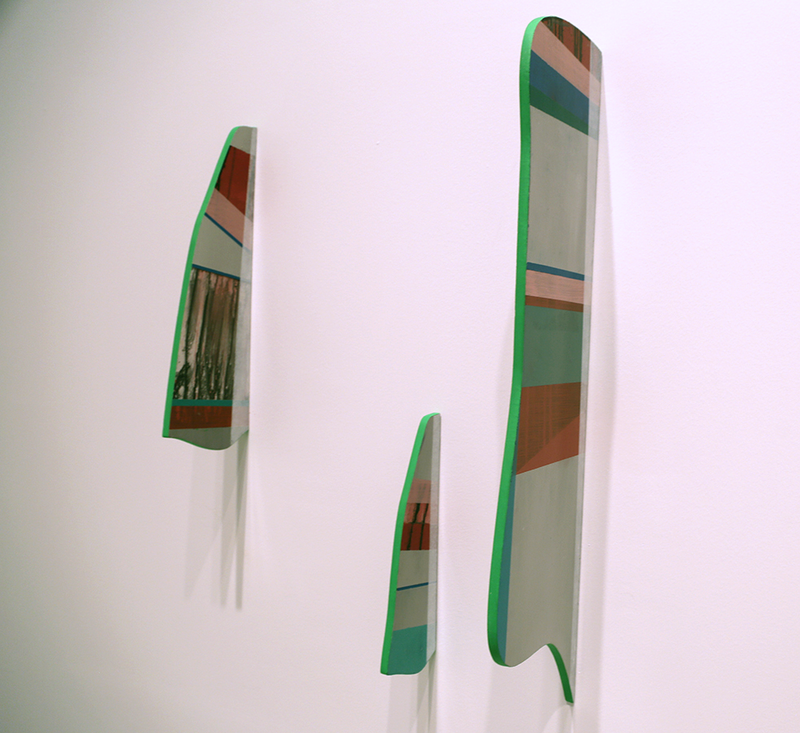 Facing the entrance is Laurie Trok’s clever suite of wall pieces, thin fins of wood projecting straight out, creating the illusion that their neon green edges are mere lines applied directly to the wall. 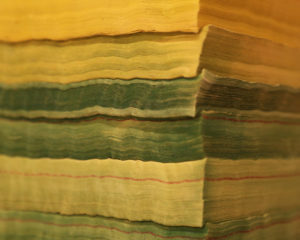 Its neighbor, Katie Murken’s Continua, uses phone books dyed with rich, bright colors and stacked high into columns. Seen at a distance, they appear minimalist in conception; up close they reveal velvety, rainbow surfaces. 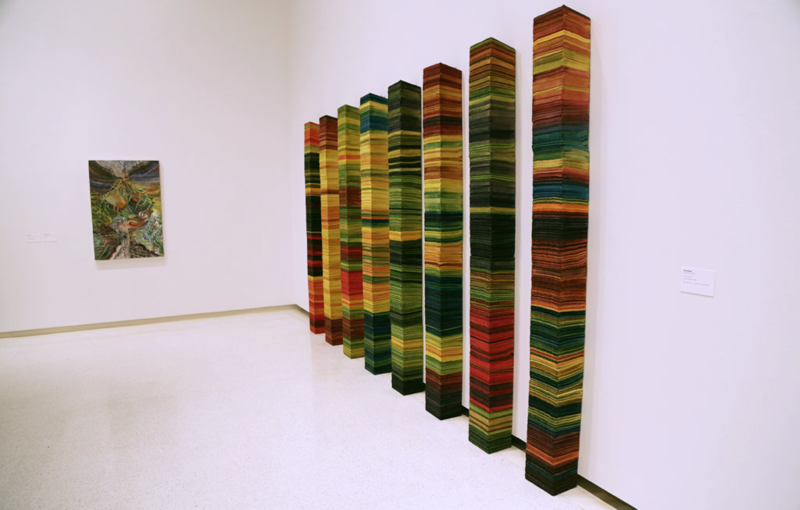 To me they suggest core samples taken from sedimented layers of historical information, rendered archaeological by the emergence of digital media. 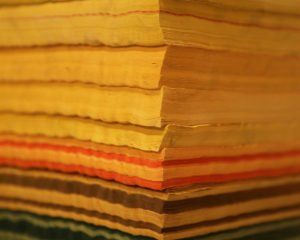 Katie Murken, Continua, phone books and dye, each 8.5 x 7 in x 8 ft. Bright, saturated colors continue to punctuate the show, appearing in abstract paintings by Mark E. Weleski and Mia Tarducci, and in sculptures by Michael Walsh and Daniel Roth. Roth’s large floor piece is serious in intent and humorous in execution, resembling a finely-crafted piece of space junk. Its surfaces are painted cool colors but its edges are trimmed in fake fur, which animates and anthropomorphizes the work. Roth described imagining the black tufts as an alien life form, a mold or parasitic moss, finding this hulking, broken object and calling it home. 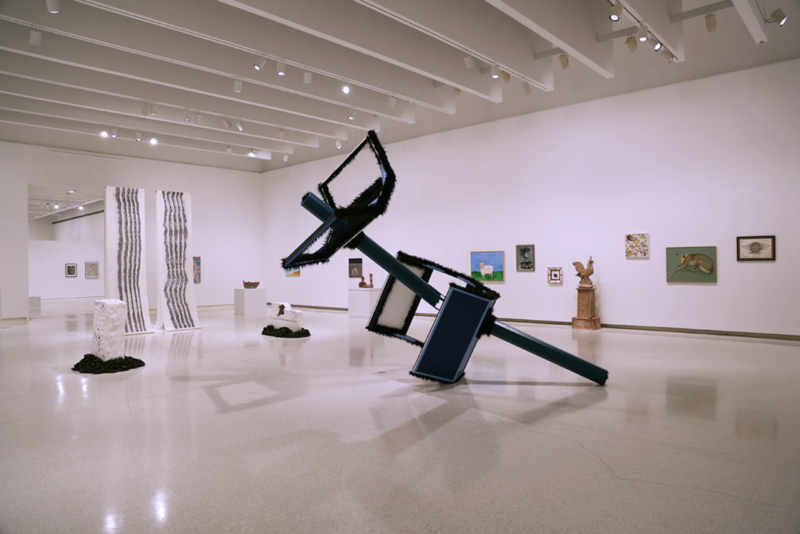 Daniel Roth, Search, wood, steel latex paint, and synthetic fur, 9 x 14 x 5 ft.
Obviously, it would be risky to generalize from one AAP Annual to “Pittsburgh art” at large; still, it’s worth pausing on Carrier’s point. We might assume that in a Pittsburgh context, “conservative” art would imply “regional” art, realistic representations of identifiable local landmarks or activities. But in the current Annual, the art has been scrubbed of regional identity, leaving formal qualities—form, color, scale, texture—to dominate. And it is precisely this absence of rootedness in place and history that, paradoxically, makes this Annual feel so conservative: The exhibition celebrates formalism and abstraction at a time when global contemporary art in general is moving in the opposite direction, towards realism, embodied experience, and historical and geographic specificity. This shift began in the 1990s, crystalized around documenta 11 (2002) and has intensified since, driving some of the most important work of the past decades, including Rachel Whiteread’s House (1993), the photo-journeys of Emily Jacir in Palestine (2002-03), and Jeff Wall’s quasi-documents of Vancouver’s exemplary banality. We live in a globalized age, but as Arjun Appadurai and others have shown, globality produces locality. Understanding how our localities intersect and complicate each other is urgent cultural work, and it’s an area where artists excel. 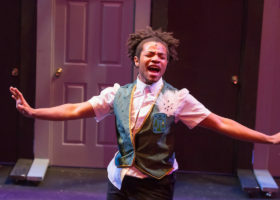 Attending to the specificity of place is important not only to connect local art more thoughtfully with art around the country and the world, but also to connect it with Pittsburgh itself. Our city is undergoing major changes—not all good, and some much worse for certain people. In this context, high formalism, however elegant, risks calcifying into indifference, or at minimum, of being received that way. All this isn’t to say that I am advocating for an Annual dominated by the likes of explicitly political artists such as Jonathan Horowitz. 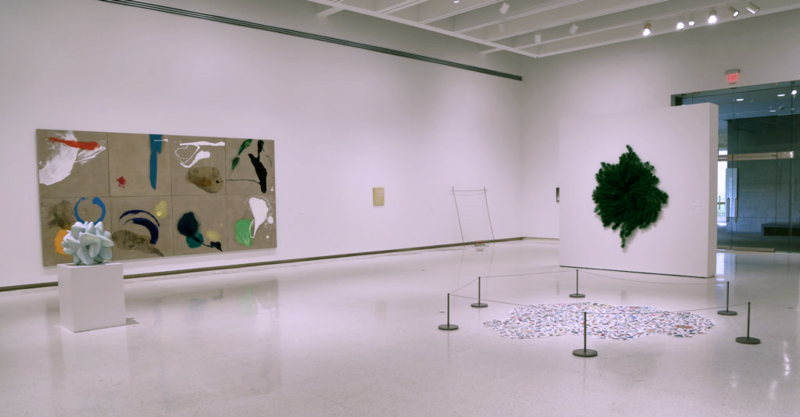 I’d settle for the gentler social critiques of David Hammons. Otherwise, a little contextualizing information would go a long way in guiding visitors through this vast and eclectic exhibition. 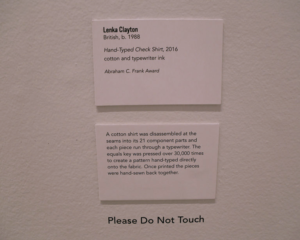 Apart from a prefatory statement from juror Sarah Lehrer-Graiwer, no didactic panels are provided—with the notable exception of one for Lenka Clayton’s Hand-Typed Check Shirt. 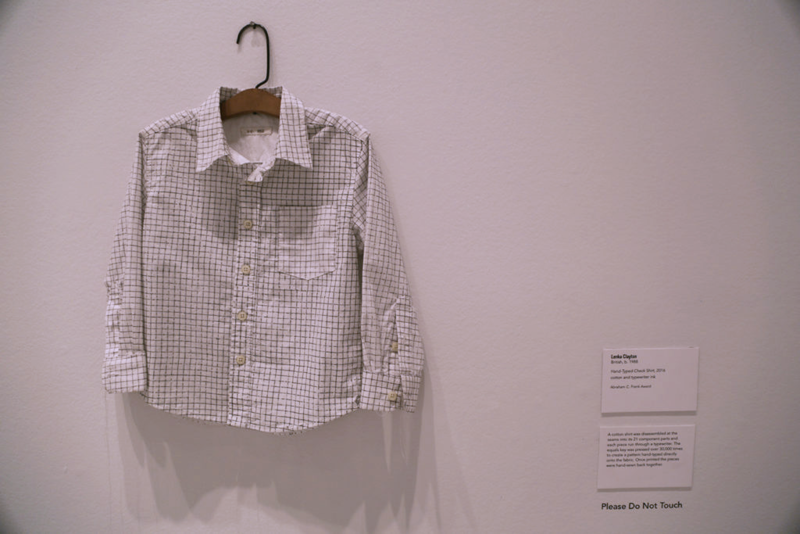 The wall card explains that the artist disassembled the child-sized shirt, passed it through a typewriter to create a checkered pattern with over 30,000 strokes of the “=” key, and sewed it back together. 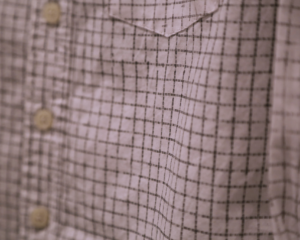 That minimal information grounded and enlarged my viewing experience, evoking repetition and ritual, the invisibility of labor in garment manufacturing, and the work of mothering. During the opening reception I caught up with Danny Bracken, an accomplished North Side artist who has used projectors and iPads to create intimate, multi-sensory installations and sculptures. He is not an AAP member. To him the organization always just seemed like an old club for Pittsburgh painters. But the high quality of the current exhibition impressed him sufficiently to make him consider joining. “I’ll try anything once,” he said. Of course, by the time the next Annual arrives, the iPad may be obsolete. But, as the saying goes, if at first you don’t succeed, try, try, try again. Andrew W. Allison, Pool, acrylic, twine and cotton, approx. 9 x 10 ft.